I've been really working on getting my family (and myself) to eat more vegetables lately. I've been trying some new things, like oven-roasted brussels sprouts, and revamping some old favorites. 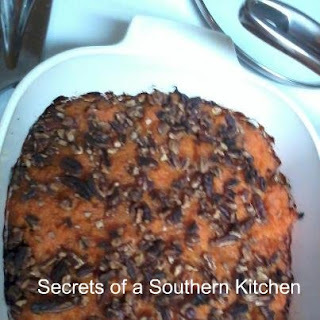 We had baked sweet potatoes not long ago, and I got the bright idea to do a healthier version of a holiday favorite, sweet potato casserole with pecan praline topping. 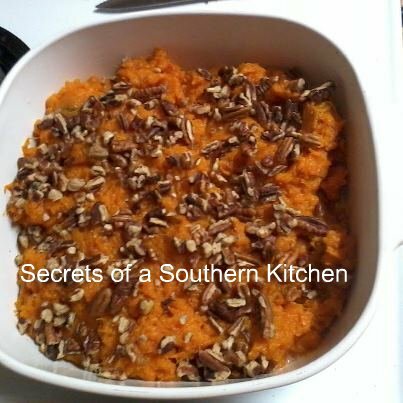 The regular version is loaded with sugar, from the canned sweet potatoes/yams at the start, to additional sugar added, to the sugar in the topping. In my original post of this recipe, I called it "Sweet Potatoes You Can Eat for Dessert"--it's just that sweet and gooey, and I have family members who actually do it eat it for dessert. I thought I had over cooked these, the nuts were getting very browned. Without the familiar brown sugar and butter mix, I wasn't really sure what to look for, but they tasted fine. (I actually forgot the cinnamon in these, so we just added a dash of cinnamon to our serving on our plate, then just stirred it in slightly. Still tasty). My family decided they liked the sugar-free version better than the regular one for everyday eating. My son said it tasted like it should be eaten with the meal, and not afterwards. I liked the healthier version in several ways. 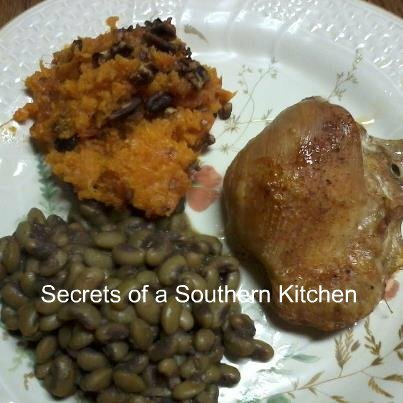 I usually use canned sweet potatoes/yams during the holidays. Because they're already cooked with a sugar syrup, although I drain it off, it can be hard to regulate the sweetness. And while I never thought that you'd hear me say it, you can have too much sugar in a recipe. It also seems to me that the last several times I've made my regular version, the sweet potatoes have been mushier, and there's definitely a higher proportion of sugary juice to potatoes in the cans--as a result, sometimes I have trouble getting the middle to set without over browning the top--I usually have to cover it with foil at some point to keep the topping from burning. 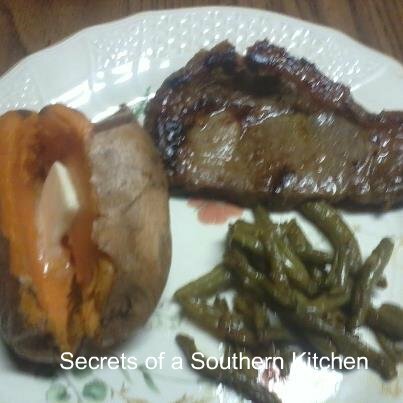 Conclusion: As long as my son and I are working on reducing sugar in our diets, I'll be making this version for our everyday meals--and when it's holiday time, although I'll probably go back to my regular version on special occasions, I'll bake my own sweet potatoes and go from there instead of using the canned. Do you have a sugar free recipe to share? Be sure to link up with the linky tools below!